First of all - I've tried many *-to-PDF converters so far and I have to say that WeasyPrint is by far the very best. Thanks for all the hard work. I have python code that generates an HTML file and then uses WeasyPrint to convert it to PDF. I think that almost everything works really well except one strange thing. When I have underlined text in the HTML, in the PDF version the underline is sometimes too short. As you can see, in the PDF version, the underline in the first bullet ends just under the letter A in "LAN:" (i.e. 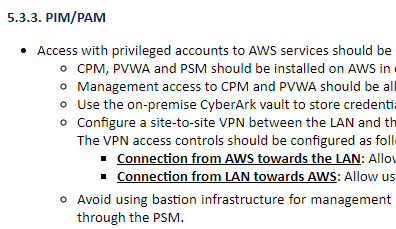 one letter from the end) and in the second bullet it ends just under the letter A in "AWS:" (i.e. two letters from the end). I couldn't find any satisfactory explanation for this weird behaviour - can you? @iyuvalk What CSS are you applying? What WeasyPrint version are you using? and, like you saw in the previous example, it works in the HTML but it's only in the PDF that it looks different. Also, I tried to move the closing "</em>" tag to include the colon ":" sign just to see how it would look like in the PDF and the result was even weirder as the underline ended just under the middle of the W of the word AWS which is something that cannot be done (to the best of my knowledge) with CSS as either a letter is underlined or it's not but it can't be half-underlined, right? Ok... I tested it now with the renderer (in python -m weasyprint.tools.renderer) it happened the same way even when I used <u><strong> instead of <em>, after few tweaking I found out the culprit, it's the text-align: justify; statement in the CSS (configured for the "body"). If I remove it from the CSS the underline reaches the end of the text and it looks just fine. I found a way to work around it... if I still use the <em> and configure it in the CSS to be displayed as an inline-block it works correctly. But still, isn't it some sort of a bug that WeasyPrint doesn't create the underline correctly if the text is in text-align: justify; mode? invidunt ut labore et dolore magna aliquyam erat.